Enlisting the help of several Olympic athletes including Janet Evans and Apolo Ohno, BMW unveiled its ActiveHybrid 3 and ActiveHybrid 5 sedans, the new hybrid versions of the automaker's ubiquitous 3-series and 5-series vehicles at the Detroit Auto Show today. The ActiveHybrid 3 will be powered by a 6-cylinder twin-turbo 3.0-liter engine producing 306 horsepower, but this will be combined with a 54-horsepower electric motor for a total of 340 horsepower. The ActiveHybrid 3 gets 36 miles per gallon and comes with an 8-speed automatic transmission. The BMW ActiveHybrid 5 claims to be the most powerful and efficient full hybrid in its segment, and will come with a twin-turbo six in-line engine paired with an electric drive system for a total output of 340 horsepower. We loved the more streamlined front end of the ActiveHybrid 5, which has slightly different headlights from the ActiveHybrid 3 but featured the same beautiful wood center console design. Though fuel economy in the 30s may not make you blow your top, it does represent significant advancement in the efficiency capabilities of performance vehicles, which might be the ticket to bring people with hybrid vehicle performance anxiety into a greener car. And that city car look that mainstream buyers often don’t care for is also nowhere to be seen in these traditional-looking performance sedans. We’re hoping the green cred and maintained performance of these BMW hybrids will get some more skeptics on board the green movement, and fully expect the efficiency of these cars to improve along with advances in battery and motor technology. Check out our gallery of photos to see all the details of these high-quality cars. 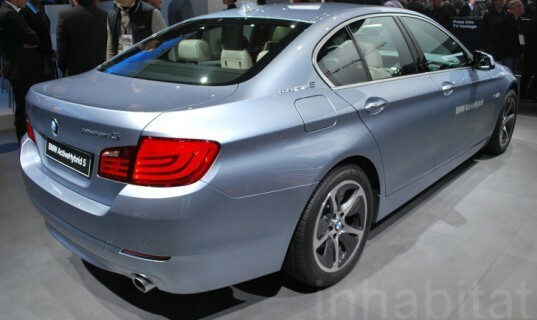 The 2012 BMW ActiveHybrid 3 will go on sale on February 11. 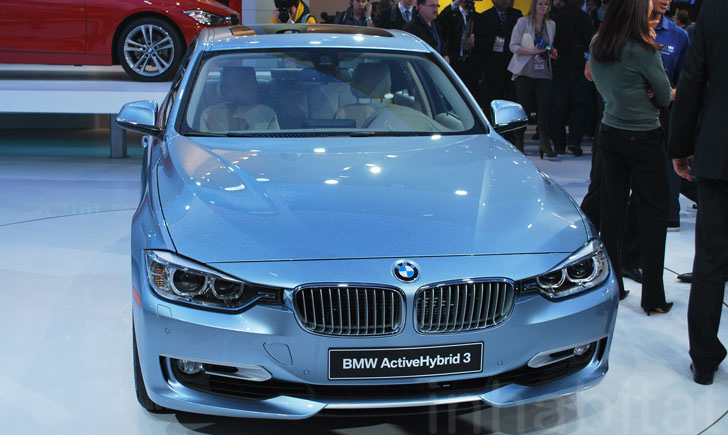 The BMW ActiveHybrid 5 claims to be the most powerful and efficient full hybrid in its segment. The cars will come with a twin-turbo six in-line engine paired with an electric drive system for a total output of 340 horsepower. We loved the more streamlined front end of the ActiveHybrid 5, which has slightly different headlights from the ActiveHybrid 3. Both cars feature the same beautiful wood center console design. Though fuel economy in the 30s may not make you blow your top, it does represent significant advancement in the efficiency capabilities of performance vehicles, which might be the ticket to bring people with hybrid vehicle performance anxiety into a greener car. And that city car look that mainstream buyers often don't care for is also nowhere to be seen in these traditional-looking performance sedans. We're hoping the green cred and maintained performance of these BMW hybrids will get some more skeptics on board the green movement, and fully expect the efficiency of these cars to improve along with advances in battery and motor technology. Check out our gallery of photos to see all the details of these high-quality cars. These inset TVs are a nice touch to the interior.